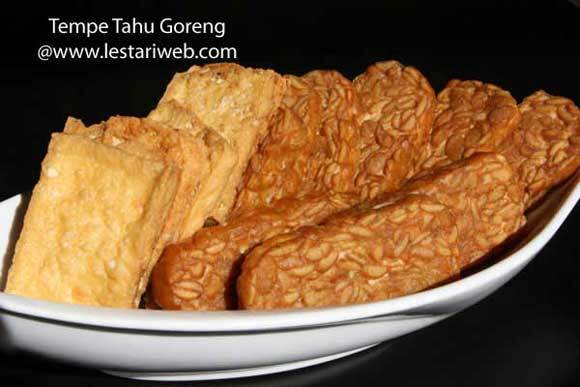 Tempe is one of daily or "must have" menus & originally made in Indonesia. It is regarded as a Javanese invention. 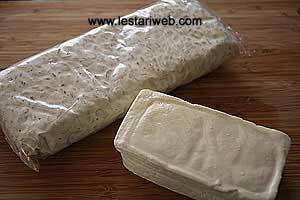 One says tempeh is healthy nutrition with high protein. Other says, it is a cheap food, consumed by low to middle class of Indonesian society. It depends from which prepective you see it. 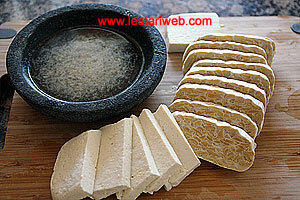 The fact is, tempeh & tofu are good food with high protein & reasonable price that every Indonesian can afford ! People even said, it is merely a meat subtitute for many Indonesian who're not able to buy meat which's' getting more & more expensive nowdays. Though it looks simple, not everybody able to make tasty fried tempeh & tofu, especially for one who has no experience with asian's specialty. Like my colleague who told me one day : Tofu is tasteless, like eating sponge!!! ha hah... I asked her, how she made it. She said "Just boiled & eat!" OK I understand & just grin ;-) So if you are one amongs my colleagues then you can try this recipe. You will find out, tempeh & tofu aren't just a white sponges'. In contrary, Tempe and Tofu can be cooked in many varieties way like we Indonesian do, for example: in a sweet seasoned spices called Tempe Bacem, seasoned crispy-fried Kering Tempe or a light variant of a tofu and tempe in spicy coconut milk Tahu Tempe Kuah Santan. You can have them also as a spicy Tempe sauce called Sambal Tumpang or fried then bruised in spicy sambal, famous as Tempe Penyet and last but not least for spicy Sambal Tempe. Had you enough?! ;-). I hope you give the recipe a try and you'll' gain better sight & understanding of authentic Indonesian Tempe & Tofu Recipes, not just westernised or veggie Tempe-Burger!!! 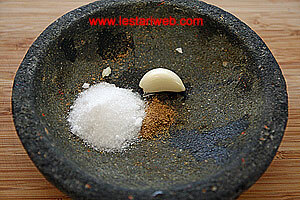 For Marinade : Grind garlic, koriander & salt in a mortar / grinding stone and grind until smooth. Add 100 ml cold water. Stir to mix. Try the taste & add more salt if necessary. This step is necessary to get the optimum saltines. 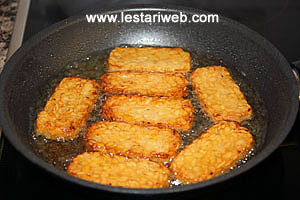 Slice the tempe & tofu in 1cm thinly rectangular shapes or as desired. Put aside. Soak the tempe & tofu in the mixture one by one with your hand. Make sure both side are marinated well. Put aside for 15 minutes. 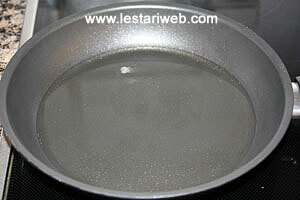 Heat enough oil in a frying-pan on a medium heat. 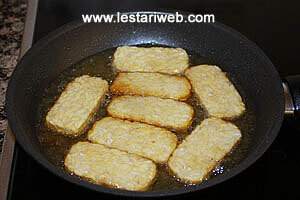 Deep-fry the sliced tempe then tofu over medium-high heat in a hot oil. Turn around to the other side until both sides golden brown. Pat-dry with kitchen paper if necessary. Serve hot with Stir-Fried Water Spinach and Sambal Kecap. Notes: * A little bit salty is better than too little salt. 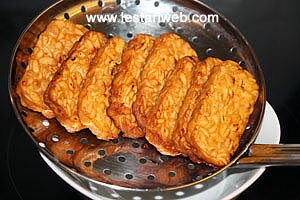 The salt consistency will be reduced during frying process & reverse method is not applicable.